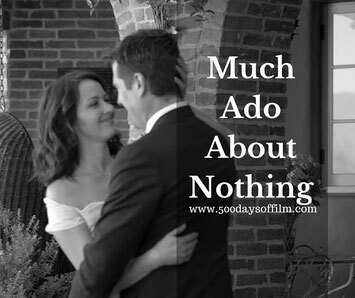 500 Days Of Film Reviews Joss Whedon’s Much Ado About Nothing And Finds A Stunning And Contemporary Retelling Of Shakespeare’s Classic Romantic Comedy. After pretty much owning the superhero genre with Marvel movies such as Avengers: Age Of Ultron, Joss Whedon returns to his roots, reconnects with his friends and makes a fantastic film of a classic Shakespeare comedy along the way. Whedon prepped his movie in a month and shot it in twelve days. That’s quite some work ethic right there. However, Much Ado About Nothing does not feel in the least bit rushed and I really enjoyed the film. Whedon has admitted that the only way he could achieve this phenomenal time frame was by working with actors experienced in performing Shakespeare’s plays. They all bring a light touch to the dialogue, which is always such a relief. The performances are all fabulous - I particularly loved Amy Acker as Beatrice and Alexis Denisof as Benedick. The play’s humour is also well portrayed - Nathan Fillion made me laugh out loud as Dogberry. Meanwhile, the film just looks stunning and contemporary. Shot in black and white, every scene gleams with a wonderful light. Everything and everyone looks gorgeous in this movie. This more than anything is what has stayed with me since watching the film. So, if you are in a Shakespearean mood and fancy a lovely and light, romantic and comedic film, I would highly recommend Whedon’s Much Ado About Nothing. The film was shot in Whedon’s own house, a building designed and built by his architect wife who also happens to be a movie producer. Have you watched Much Ado About Nothing? What did you think of this movie?